I made these for my son’s half birthday last year. He’s a summer birthday so he gets to celebrate his half birthday at school. He wanted an army theme so I made these up and all the kids loved them. I loved them because they look (and taste) awesome but actually didn’t take too much work. I mean, buying them would have taken a lot less work but every now and again I love to something special just for one of my guys. These look more complicated than they are and I’m so serious in saying that anyone can do this. First I made up two batches of yellow cake batter. White is better but yellow will work. I did it from a box because I like things easy like that. You can use whatever recipe you want though. Then you’ll need to pick whatever colors you want. Since I was going for the army camo look I used these Wilton gels. I used black, brown and moss green. I’ve found they are the best and go a long way. You’ll only need a little bit. I divided the batter into four smaller bowls and mixed the colors. For the tan I just used about half the amount of brown food coloring. Then cupcake liners. This particular batter wasn’t very thick so I ended up droping a small spoonful of one color, then another, then another to get them to be like drops of batter instead of forming level layers. This probably took the longest amount of time. Going back, to save time I probably would have made the batter thicker by using this recipe. Preheat oven to 350 degrees F. In a stand or electric mixer add the cake mix, eggs, oil, water, sour cream, pudding mix and chocolate chips. Beat until well combined, about 1 1/2 minutes. Will be thick. Pour evenly into 2 well greased 9 inch cake pans. Bake for 30-35 minutes or until toothpick comes out clean from center of cakes. Let cool completely. This would have made it nice and thick and super moist. Next time! Also when you fill them you want to make sure they are about 3/4 full so they have a nice cupcake top instead of being flat. They just look preittier this way. Cook them however the box says. I normally never use a recipe for frosting anymore but if you want to get all technical, this is the closest I get to it. In a standing mixer fitted with a whisk, mix together sugar and butter. Mix on low speed until well blended and then increase speed to medium and beat for another 4 minutes. This is where I got my cupcake tip kit. 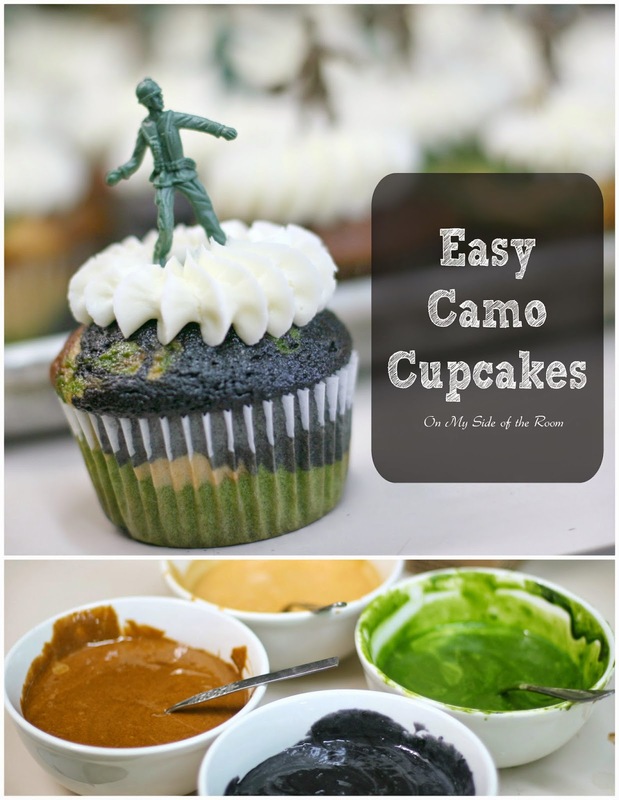 It is makes cupcakes look ahmazing and like they took a lot more work than actually do. This one was just one quick squirt and an army guy plopped on top. We got a big bucket of army action figures and so I let my birthday boy do that, he loved it. Bam. And there you go. You can really use just about any color combination and it will make your cupcakes that much awesomer. Cause that’s totally a word.